Cherry Pie Cupcake from Violet's of Pasadena. Summer in a little silver paper cup. MARTHA'S MAD FOR IT: When you get a shout-out waaaay from across the country, from Martha Stewart no less, on national television, well, it can be sweet as pie. 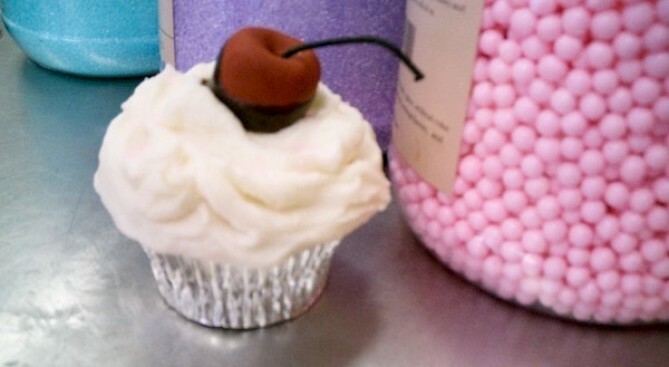 Or, in the case of Violet's in Pasadena, sweet as a Cherry Pie Cupcake. They got accolades from Ms. Stewart about this particular pastry, and now we can't stop pre-lip-smacking about it. Must go get. INVESTED: If polled, most people can get behind vests. Not just hand-knitted-"I-love-you" sweater vests, or puffy-shiny go-to-the-mountain vests. We're talking slightly masculine, well-tailored, wear-with-jeans type tops. LF has one we're fond of. We're thinking a frilly tuxedo top might be the ticket under this pretty piece. "BEST FRIENDS FOREVER": Authoress extraordinaire Jennifer Weiner keeps on truckin' up those top books lists, and for good reason. She goes beyond the chick-lit-y label and creates stories that are memorable. Her newest work "Best Friends Forever" is out on July 14th. Beach time, or just-laze-around-the-bed time, too.